"I had a vaginal breech birth and no one was more surprised than me"
After a healthy, event-free pregnancy, first-time mum, Ella suddenly found herself at 35 weeks, in premature labour looking at a breech delivery. 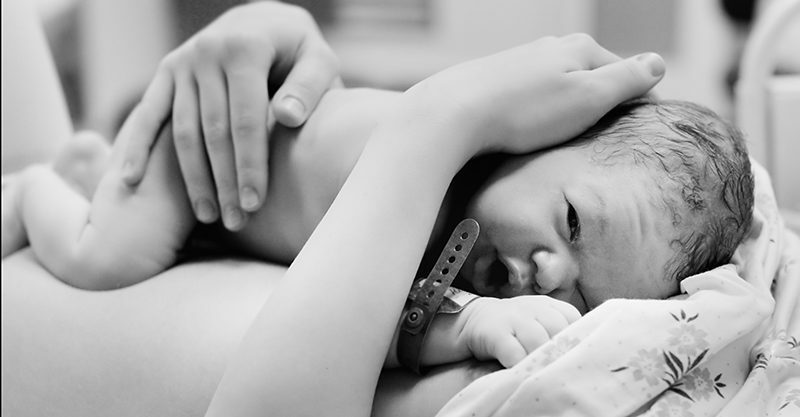 “After my regular obstetric appointment at 35 weeks pregnant, my doctor discovered our baby had turned into the breech position since our last appointment. This news freaked me out because I really, really didn’t want to have a caesarean, and I thought that was my only option with a breech baby. My doctor was unfazed, assuring me that there was still plenty of time for my baby to assume the head-down ready-to-go position once again. How wrong he was! Have I peed myself? Or did my waters just break? Three days later, my husband and I attended our last antenatal class at the hospital and went home to bed after a hectic week. A couple of hours later, I got up to go to the loo and felt something pop like an elastic band inside me. In my sleepy dazed condition it took me a moment to realise the gushing liquid pooling around my feet meant my waters had just broken – five weeks too early. After a call to the hospital – no, I hadn’t had any contractions yet – I woke my husband, packed a hospital bag and we headed in for observation. By the time we got to the hospital, it was 1am and contractions had definitely started. ‘Do you know this baby is breech?’ I panted to my midwife between contractions. ‘I don’t think I’m meant to be doing this.’ Referring, of course, to the very active labour I was currently experiencing. ‘Oh, yes!’ she said, almost casually. ‘Your doctor knows you’re here and he wants to see how you progress. He’ll be in later to check on you.’ It was 1.30am. Labour was hard – all the contractions were in my back, and I was having terrible trouble communicating. The contractions were just tumbling over each other so I could never gather myself together and make a plan to get through the next one. They were relentless and all I could do to cope was groan through them. What I wanted was a ice pack on my back, but I just couldn’t ever make the words come out to make this happen. I spent an hour on all fours on my bed, feeling like my body was burning up. I was so very hot, I couldn’t bear anyone touching me or trying to rearrange me. I was probably not being a great patient at this stage. At about 3am, I was encouraged to have an epidural. Breech births are typically slow, I was told, because there is no baby head banging away on the cervix dilating it. Thinking I was in this labour game for the long haul, I agreed to an epidural, and was relieved to get some relief (!) once the drugs took effect. I could lie back with the lights turned down low, catch my breath, and process that I WAS HAVING THIS BABY TONIGHT. Post-epidural, I was checked again and I was 6cm dilated. Things were progressing nicely. At 5am, with another internal completed, the lights were turned up, the blankets peeled back and it was show time. I was 10 cm dilated and my doctor was in the building. With his entry into the room, all the energy changed. It was all action stations – he checked me and was happy with what he saw (his words, not mine!). He explained that he was going put my feet up into stirrups and do an episiotomy to ensure a safe delivery. With every word he spoke, he pointed his finger at me and all I can remember now is him and me and his finger. What I didn’t realise at the time was that I was now in a crowded room. Being a public teaching hospital, students had been called in to view my vaginal breech birth – so there they all were, lined up against the wall at 5am on a Friday morning, getting a bird’s eye view of proceedings. But I was completely oblivious to this. In my world, it was just me and my doctor’s pointing finger. So with feet in stirrups and a large episiotomy completed – which I didn’t feel thanks to the residual effect of the epidural that was rapidly wearing off – I was told to push. Which is hard to do when you can’t really feel your contractions and have to follow the midwife’s directions on when and how to push. Bottom out, legs out and the body slipped out easily. Then it was time for the shoulders to be born. These were the widest part of the baby and definitely the most uncomfortable. My doctor reached up inside, put a hand over the baby’s shoulder and then rotated it downwards to release it into the world. Now our baby was all but born – just the head to come. With that, the doctor dropped the end of my bed so my baby’s whole body was suspended in mid-air, with gravity doing all the work to birth the baby’s head smoothly and gently and without any drama at all.